Fishing Question (4/28/2013) From Tom Crosby; Hey Jeff, A couple of years ago you and I had a discussion about shiners. I said once we ran out of shiners we couldn't buy a bite. You told me that it was a state of mind. Well I am trying to prepare for the upcoming opening fishing season and planning on worst case scenario, no shiners! What do you suggest we use? You said it was more about profile size than species of bait. Looking for some suggestions on minnows and artificials. Lead me to the promise land of bait! A) The reason that so many anglers have tunnel vision about Spottail Shiners is because they work. In fact they work so well and have been so easy to get that most fishermen who use them, have never really been forced into experimenting with other baits. Now before I say another word, hear this loud and clear; There will be a day during this season that I will say something like; "I really wish that I had some Shiners". That said, most of the time, I can catch plenty of fish using other baits, even artificial. In spite of their reputation as finicky, lethargic feeders, Walleyes are eating machines. They require food and plenty of it, especially during Northern Minnesota's precious warm water period. But, since your frame of reference is how to do without Shiners, lets skip over all of the other bait categories that could come into play during mid-summer and focus strictly on minnows. When Walleyes feed, they take advantage of any situation that makes getting a meal the easiest. That could mean that they take advantage of weather to capture minnows that become disoriented, or it could mean that they roam slowly and select only premium size minnows that come within easy range. If they're facing a huge school of young of the year, 3/4 inch long Perch, then they take advantage of it. Abundance becomes their focus. Huge schools of tiny minnows are easy to get, especially during windy conditions, so they move in for the kill and gorge on them while they can. At times like these, a simple jig and minnow combination using almost any kind of minnow, or even a variety of artificials will produce good results. When the fish are in a frenzy and they're aggressive. Fatheads, Dace, Golden Shiners, small Suckers, they will all work. At times when Walleyes are less aggressive, feeding but acting choosy, then size becomes really important. Research has shown that Walleye show a preference for minnows that equal about 20-25% of their body length. So a 15 inch Walleye is looking at a 3 to 4 inch minnow as a prime target. When you think of it, that just happens to be about the exact size of a nice Spottail. Some of the Spottails that we see are even bigger, like the ones that from Lake MilleLacs. Finding Fatheads in that size range is nearly impossible these days, but when you can, they will work like a charm. Rainbows (Dace), Golden Shiners and small Suckers are all candidates that fit into the size range. There are a host of other minnows that work too, but unless there's a reliable source, it's barely worth taking the time to list them. But on the off chance that you'd stumble into a supplier, Rosy Reds, Tuffys, Leatherbacks and small Redtails would all work really nicely. As with minnows, artificial baits should be be judged by size too. Sometimes baits in a similar size range could be effective, but most often, artificials that work best for me are on the larger end of the size range. If I'm using a Twirl Tail type bait, I'd go with a 4 inch tail vs. a 3 inch. Same thing with Shad type baits and any of the "scent impregnated offerings". One trap that anglers fall into, is the assumption that since they know how to effectively fish with a Shiner, that they can fish other baits the same way and expect similar results. Just because your favorite jig and Shiner combination works great when you apply a snapping or hopping motion, doesn't always mean that the same approach is best when fishing a larger Rainbow. 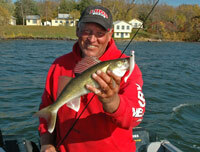 The effect is heightened even more when you try to catch Walleyes with artificial baits. More often than not, artificals need to be fished much more aggressively that the more natural live bait presentations. I don't want to make this an inventory list of baits, but let's just illustrate the point with one comparison. Let's say that we're fishing in shallow water, typical of an early season fishing trip on many of Northern Minnesota's better Walleye lakes. We're fishing a breakline from 8 to 12 feet adjacent to a shallow flat and there happens to be a good breeze for drifting. We've been having good luck using 1/8 ounce jigs tipped with with Spottails. We made sure that the minnows were anchored tight to the jig head by inserting the hook into the minnows mouth and then out through the center of the head. A fairly aggressive snap-jigging approach was working like a charm, until we ran out of Shiners. Along comes a friend who has some minnows, but they aren't Shiners, they're Rainbows. So after giving me some grief about running out of bait, she lends me a bucket full of Rainbows. For me, that's fantastic because the good size Rainbows (Dace), will almost certainly lead to a good catch. They are incredibly versatile, highly active and really durable. But unlike Spottails, Rainbows have a large mouth and don't lend themselves well to the aggressive snap jigging style of fishing. Instead, to fish them most effectively, we use a lighter jig, let's say a 1/16 ounce jig and this time we hook the minnow through only the upper lip and swim it with a pulsating motion instead of the hopping or snapping motion that we used when fishing with Shiners. Voila, problem solved the fish spotted those lively Rainbows rolling gently from side to side and gobbled 'em up! Another scenario; This time my friend swings by and feels sorry for me, but she doesn't have any minnows either. Instead, she offers my crew a handful of 3-1/2 inch Money Minnows, a bait that will catch 'em for sure if you fish 'em the right way. But now we're gonna need to be a lot more aggressive. This time we rig up 1/4 ounce Lindy jigs and use the heavier jigs at a faster pace. We cast them a swim the baits back to the boat, we spend some time ripping the baits along the breakline and we succeed in triggering enough fish to make a good afternoon out of it. That's one situation and granted, there's a lot of ground remaining uncovered. But taking some time to experiment with presentations was good idea even before the prospect of a Shiner shortage. This year it might be downright necessary. You can rest assured that we will do our best to keep you updated. So make the Minnesota Fishing Reports part of your daily routine and you will get more fish this summer. Oh and by the way, you can comment on articles too. Just join us on Facebook and add your two cents worth too. What are ya gonna do without Shiners? I know, it's gonna be a tough pill to swallow, but don't give up. Make the adjustments and Win! Compared to Spottail Shiners, these premium Fatheads or Rainbows (Dace) are effective substitutes. Compare the size (4 inches) to a Spottail. Yum's Money Minnow is a perfect example of an artificial bait that can be fished aggressively to trigger reaction strikes from shallow water Walleyes. When using twirl tail type baits, go with larger sizes. A 4 inch grub has a lot more attracting power and more vibration too. Compare the size of the that artificial to the size of the fish. A 4 inch Shad body is never too big for a 17 inch Walleye, but at times, a 3 inch tail might be too small.